New availability! 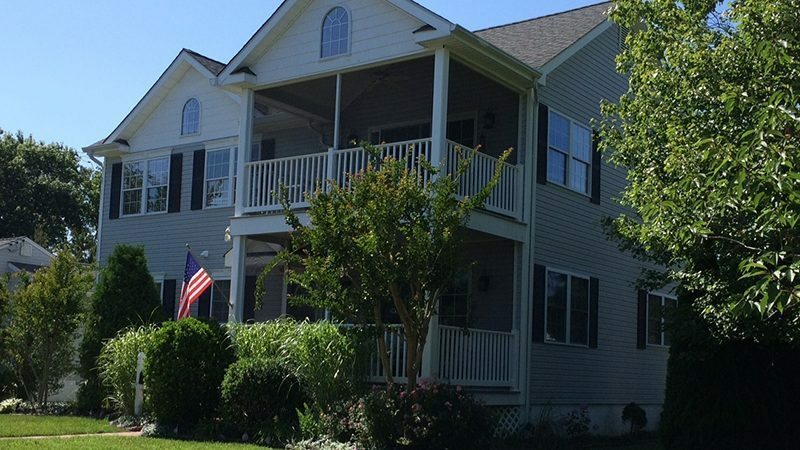 Additional weeks have now been priced and released to rent. Scroll down for complete details. Ideal location! Less than 300 yards to the beach. 3 blocks to boardwalk. 4-6 blocks to historic district/shopping. 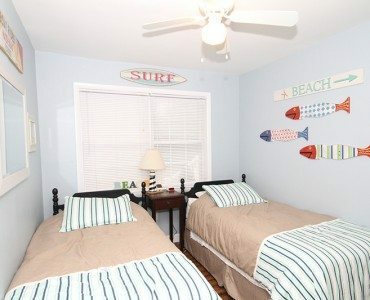 You’ll be close to the beach, boardwalk, and shopping, yet on a quiet street with ample parking. See the aerial photo of Cape May on our listing – the yellow pushpins show where the house is relative to the beach, historic/shopping district, boardwalk shops/Convention Hall. 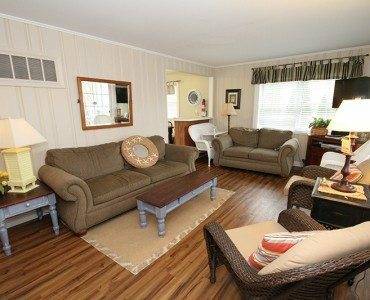 The Family Room provides a great place to come together as a family, play Wii, board games or watch a movie on the wall-mounted LED TV with DVD/VHS player and a library of movies. 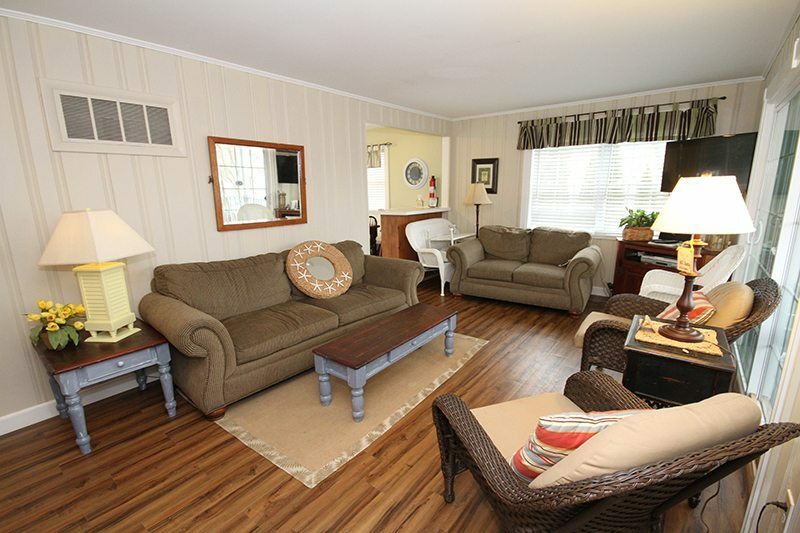 It has new wood laminate floors and comfortable furniture. It is bright from the 9 foot sliding door leading to a screened front porch. The screened front porch is great for reading the morning paper before others rise. It has a small table for 2-4 people to eat, plus a wicker loveseat and chair, both with seat cushions. At night you can hear the ocean waves in the distance when the wind is coming off the ocean. 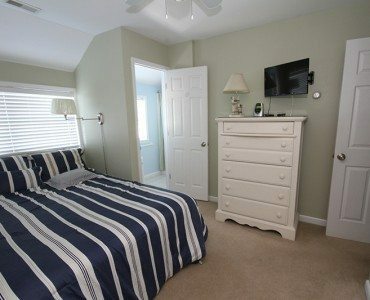 “Ocean Breeze” is Bedroom 1 is in the front corner and has a new Queen bed. It has double windows on the front and a single window on the side. There is a wonderful cross breeze and sounds of the ocean in the distance when the weather is moderate and the AC is off. 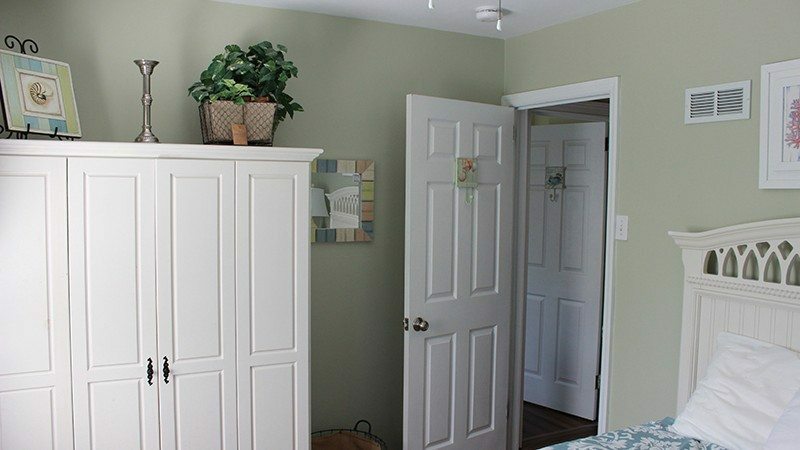 Also, a full-size armoire for storage. Palm Plantation” is Bedroom 2 is the master bedroom in the rear left corner. 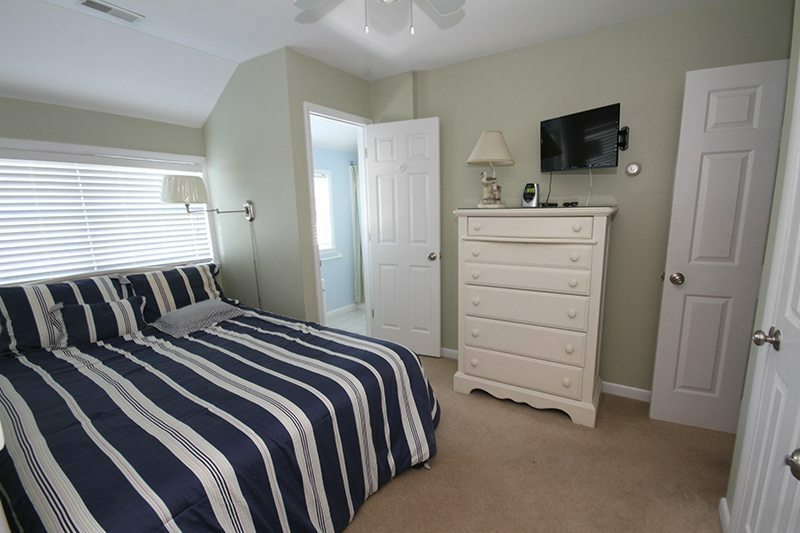 Light and bright with a Queen bed – and with the recent renovation, it now has an attached half bath and wall-mounted LED TV. “Kids Hideout” Bedroom 3 is usually where the kids sleep, as I did during the 1960s! 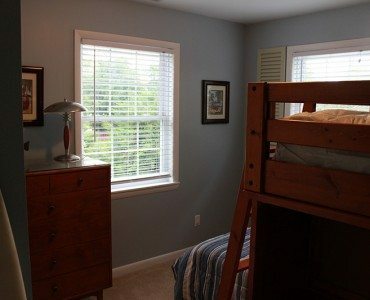 Twin over twin bunk bed with stairs plus single bed (keep your suitcases on upper bunk if you don’t want your children to use it.) 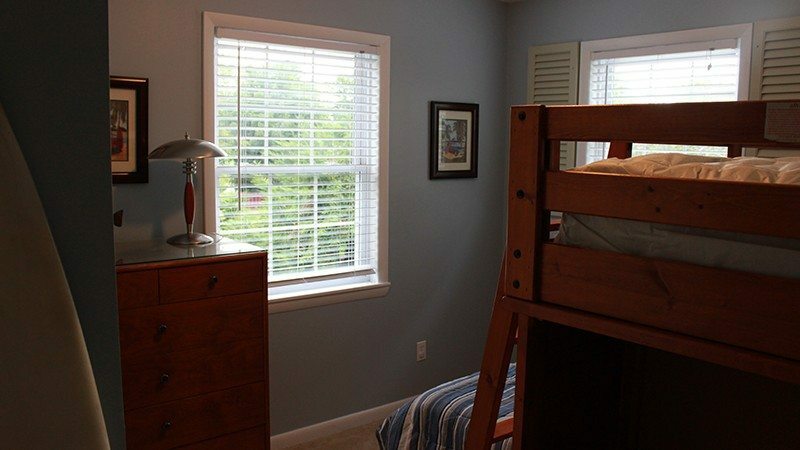 Nice big double window overlooking the big backyard plus a big armoire to hang clothes or put them in drawers. 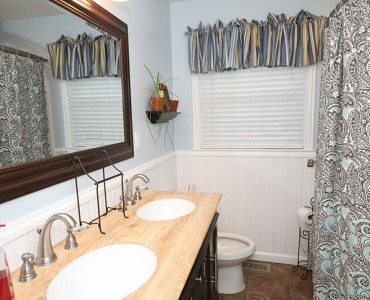 The full bathroom is completely new and has a double sink vanity, brightened by a window and complete with a tub/shower. Next to it is a stacked washer dryer if you really want to do laundry while on vacation but most people just bring enough clothes. 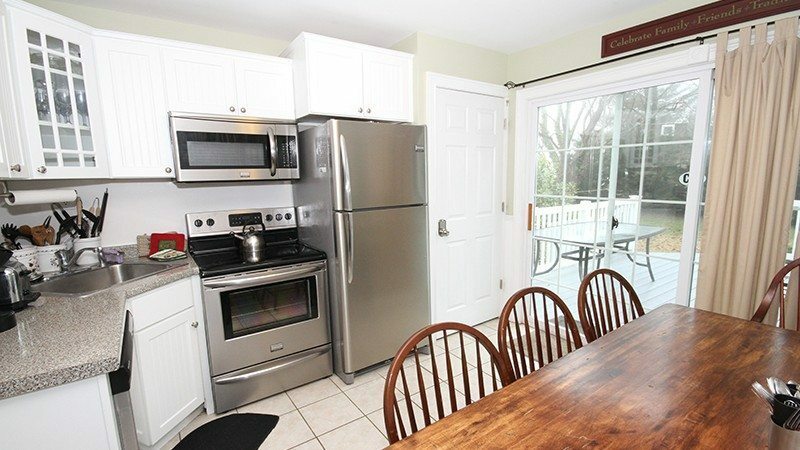 The kitchen has new cabinets and a neat refurbished butcher block table that seats 8+. The adjacent dry bar seats another 2 with plenty of dry storage below. 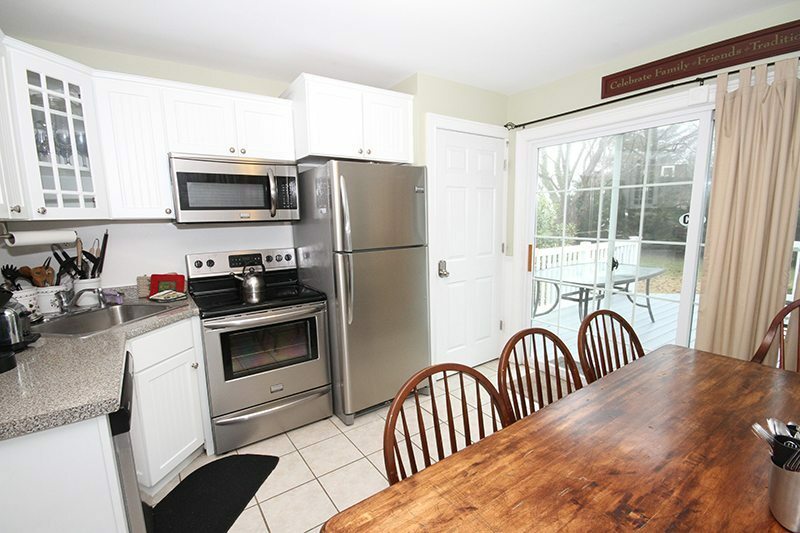 The kitchen has double windows on the side and another 9-foot slider, opening to the big back deck. 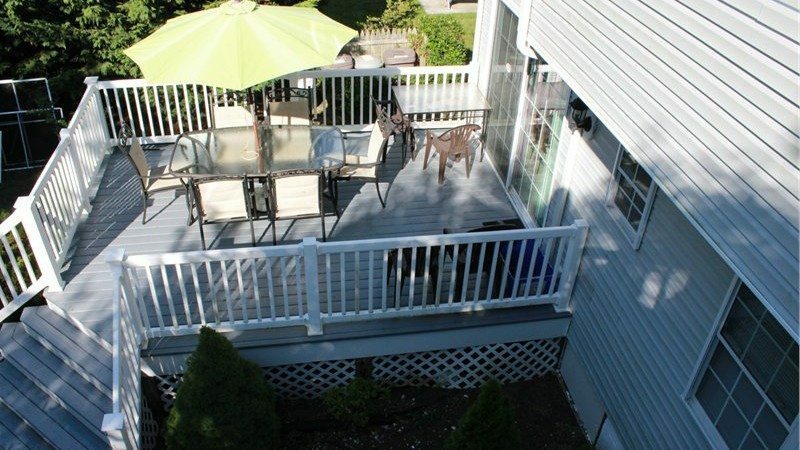 The back deck is where you’ll want to hang out before going to dinner, with its large table and umbrella. 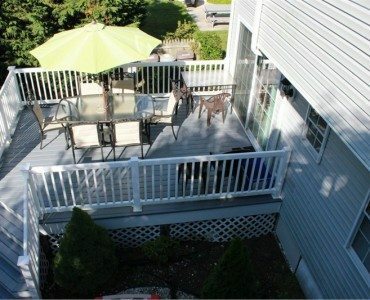 Wide stairs off the deck open up to the big backyard where the kids can play. A “renters’ shed” is provided that houses a beach cart/wagon to tote the 4 basic beach chairs and umbrella. There is a tub of misc. beach toys and adult beach tags. 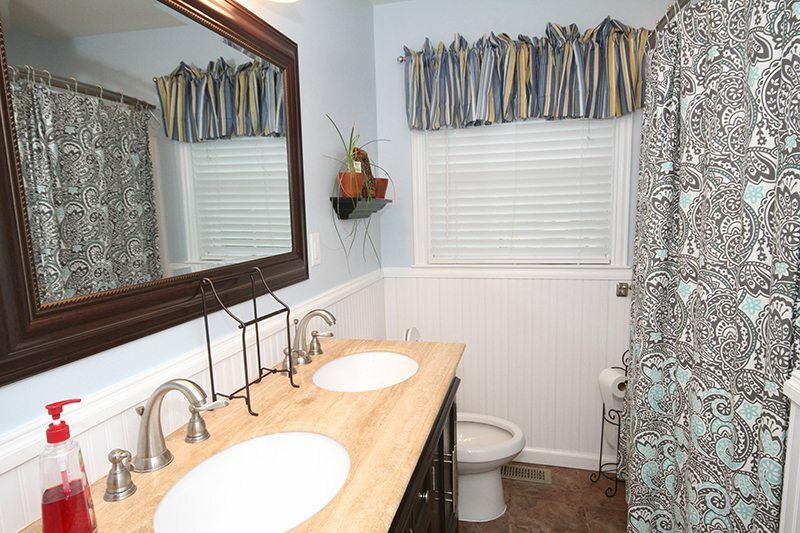 When you return from the beach, you’ll enjoy a full hot and cold enclosed shower. 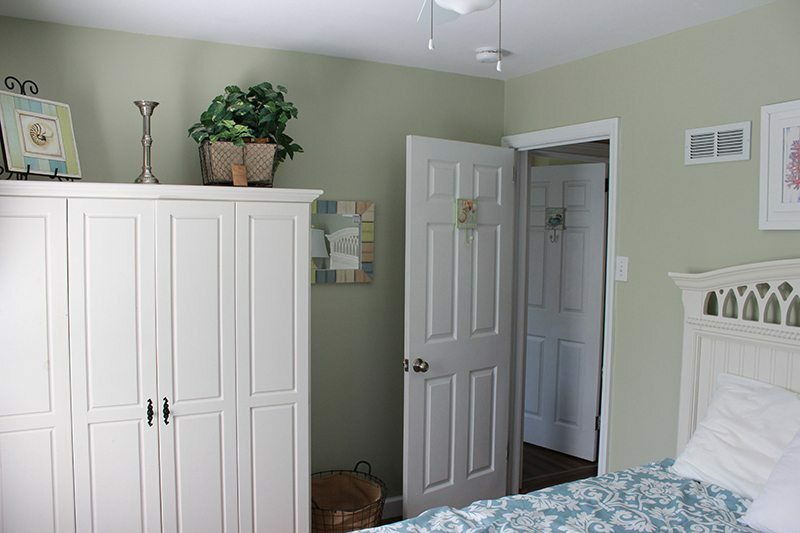 We provide beach buckets in each room to carry your shower supplies to alfresco showering. A large restored charcoal grill that was my Grandfathers is ready for an old-fashioned cookout – perhaps while sitting back having a beer or glass of wine as the kids enjoy the private backyard for playing soccer, horseshoes, or more. Bring your bikes and chain them up to the clothes pole when you’re not exploring Cape May. 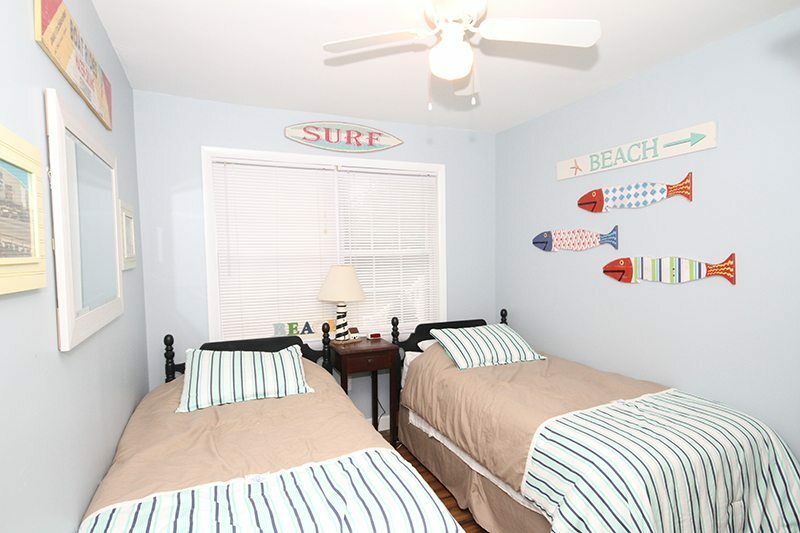 Our 5 bedroom beach house includes 2 bedrooms and a full bath upstairs plus a rear 2nd-floor deck. 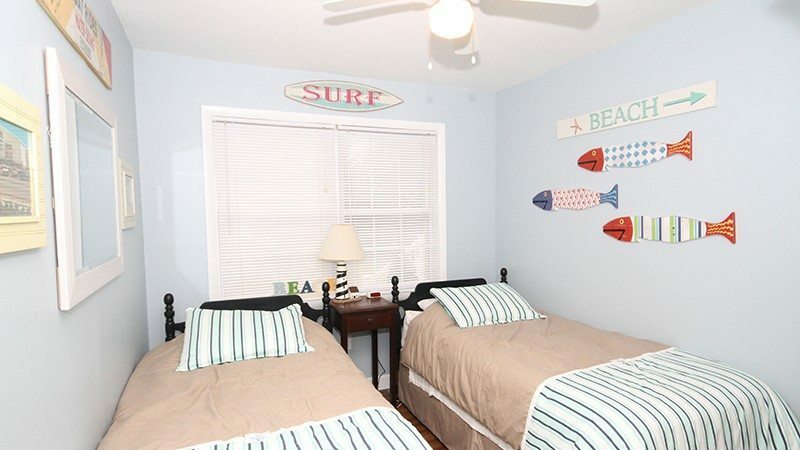 “Surfcomber” is Bedroom 4 is the corner bedroom with a Queen-size bed and windows on the side and back. 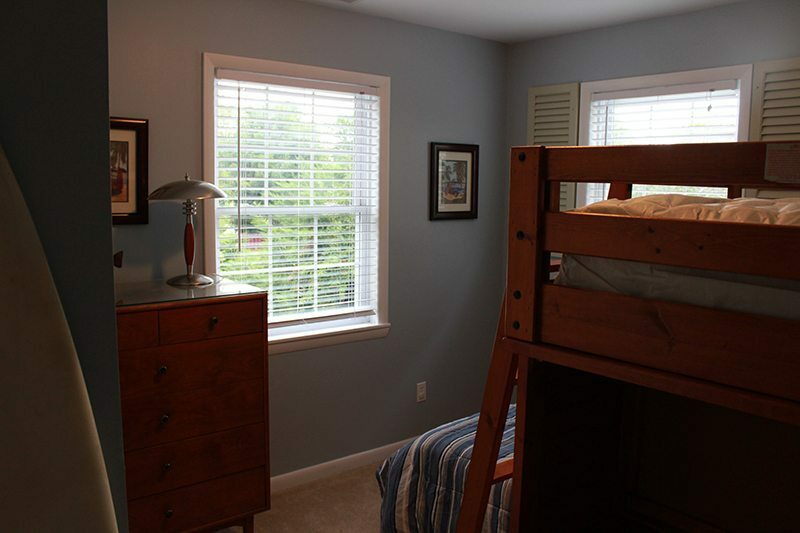 “Lighthouse Room” is Bedroom 5 – a mini-suite because it is similar to a lighthouse, being that it is at the top! 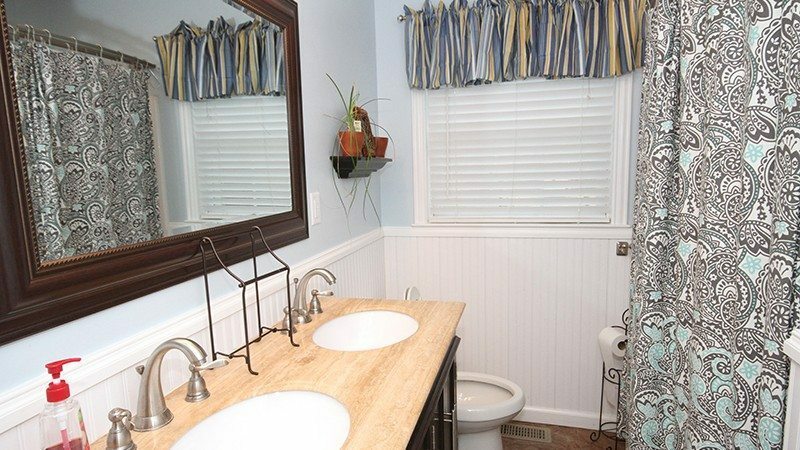 Moderate in size, but cozy with its own full bathroom, Queen-size bed, and wall-mounted LED TV. 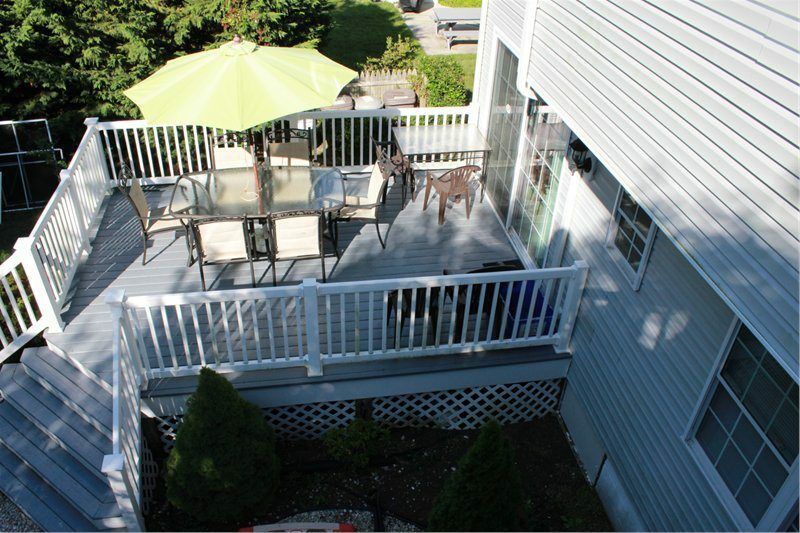 It can be accessed from inside or its own separate entrance and has a 2nd-floor sundeck that faces the backyard. 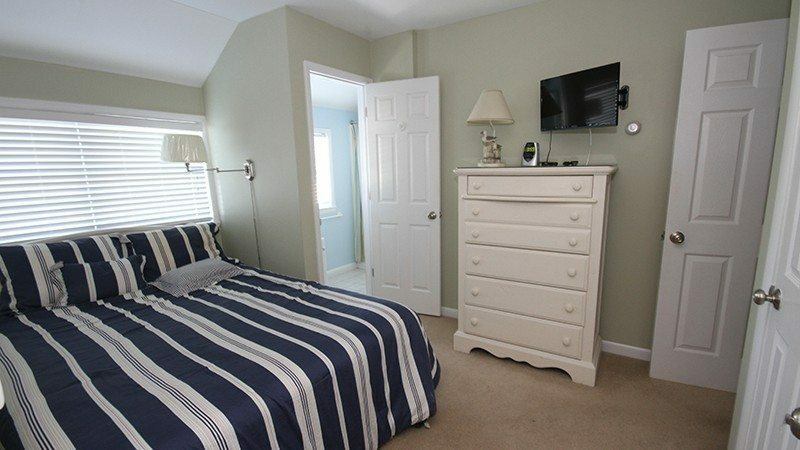 April: Weekly Fri-Fri $1595, Mon-Fri midweek $925, Fri-Mon Long weekend $925. 3-night min. May: Prior to Memorial Day weekend. 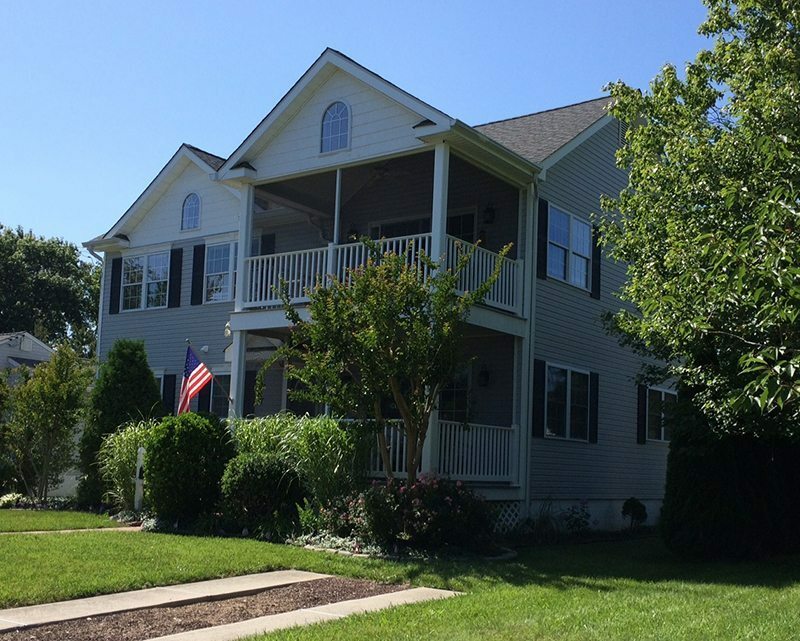 Weekly Fri-Fri @ $1595, Mon-Fri midweek $1125, Fri-Mon Long weekend $1125. 3-night min. Summer Season: Summer 2019 rates ranged from $2995 in June to 4295 in Aug. Only one stay remains this year. Reserve early for 2020. Late Summer Value Season/Sept. (prices go down as you go further into Sept/Oct) 4 or 5-night rentals will be considered. Last few weeks of Sept can be rented various ways; weekly, weekends, etc. Email us with your preferences. 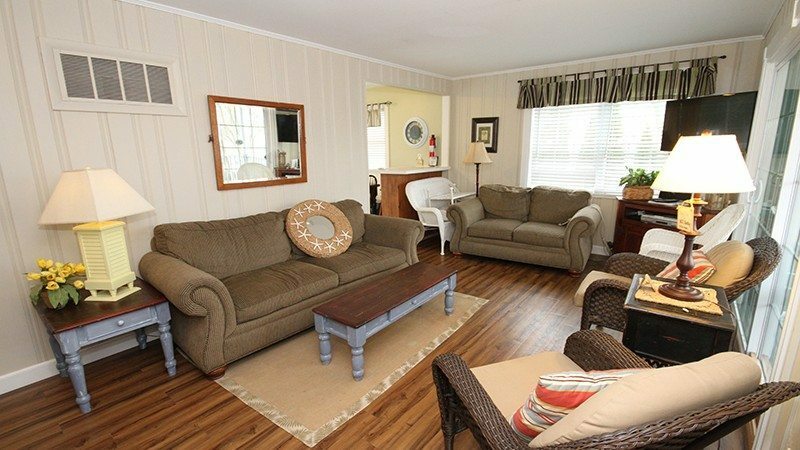 Sat 9/21- Sat 9/28 $1695 for the week or $1195 for a 3 night weekend Sun-Mon. October: Weekly Fri-Fri $1495, Mon-Fri midweek $1095, Fri-Mon Long weekend $1095 3 night min. 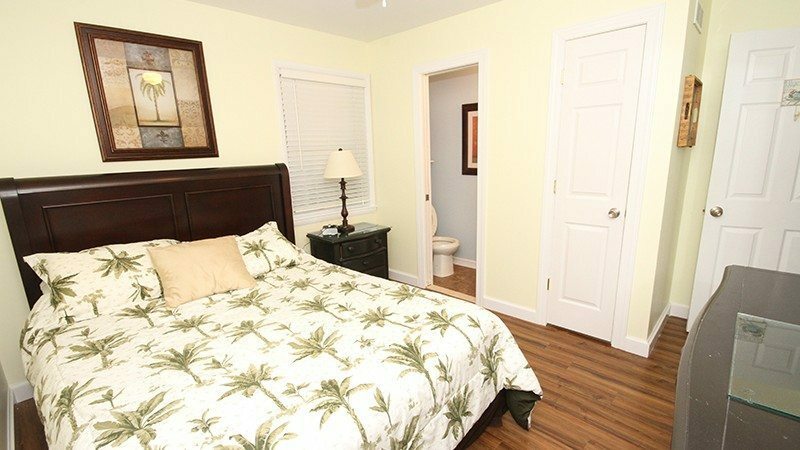 November: Weekly Fri-Fri $1295, Mon-Fri midweek $995, Fri-Mon Long weekend $995 3 night min. Late Summer Value Season/Sept. 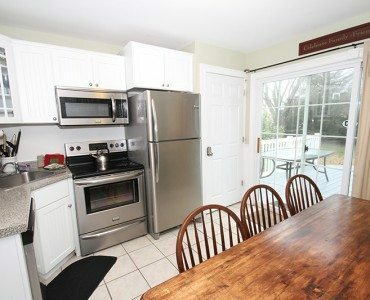 4 or 5-night rentals will be considered. The last 2 weeks of Sept, Sat 9/21- Sat 9/28 or Sat 9/28 – Sat 10/5, the first floor can be rented various ways including $1395/week $995 Mon to Fri, and $995 Fri to Mon. 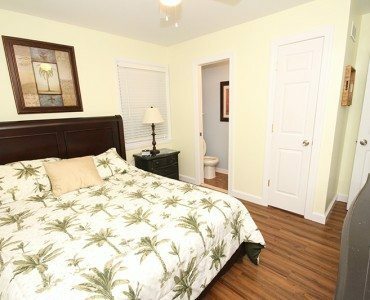 Oct: Weekly Fri-Fri $1195, Mon-Fri midweek $875, Fri-Mon Long weekend $875 3 night min. 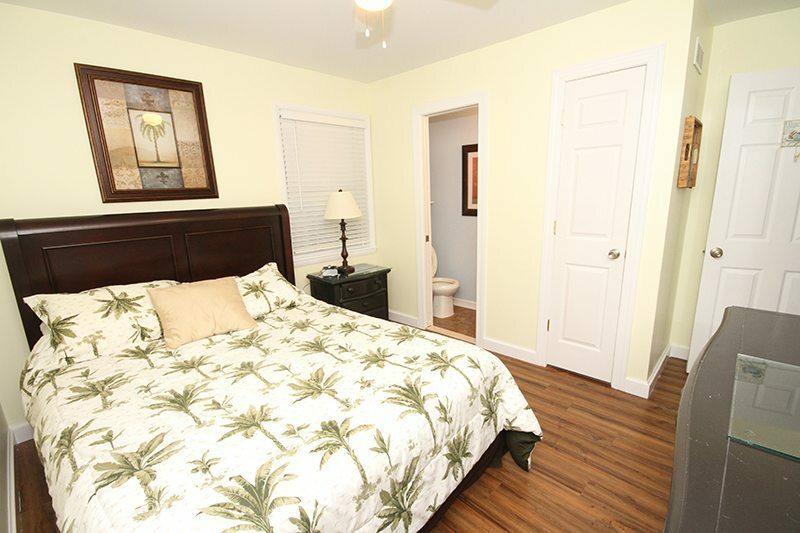 November: Weekly Fri-Fri $1050, Mon-Fri midweek $775, Fri-Mon Long weekend $775 3 night min. All rates and dates subject to landlord’s mistakes/inability to look at the calendar correctly. 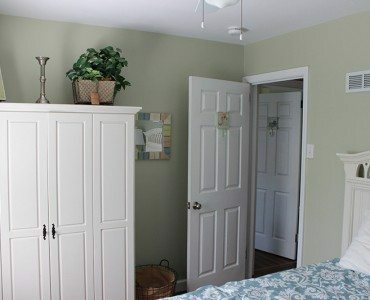 Tenant provides all linens or may arrange for them with a local linen service.